Each park of Walt Disney World has its own unique set of decorations for their gigantic Christmas Tree. They also each have a designated location for their holly-jolly tree. The Magic Kingdom’s fills the center of Town Square on Main Street U.S.A., Epcot’s occupies a spot at the crossroads of Future World and World Showcase, and the trees of Disney’s Hollywood Studios and Disney’s Animal Kingdom both rest outside of the main gates. In the case of Disney’s Hollywood Studios though, this wasn’t always the case. 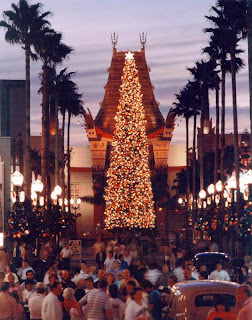 Before the rolls of film adorned the tree, and back when the park was known as Disney-MGM Studios, a tree filled with thousands of lights was placed at the head of Hollywood Boulevard, directly in front of The Great Movie Ride. The tree felt like a slice of old Hollywood, rather than a montage of the various venues of entertainment, and looked gorgeous when mixed with the decorations and neon of Hollywood Boulevard. Take a look! When I see how it used to look, without the sorcerer's hat, I can understand why the original view was more impressive. virginia, I am partial to the original view, but with or without the Sorcerer's Hat, I'd still love to see the tree back inside the park gates somewhere.